While some couples are happy to style their wedding around traditional values and elements, there is also a lot to be said for having a wedding style that is relevant to you and your relationship. Many modern couples have a cool and stylish relationship and this is being reflected in a growing number of wedding invitations these days. 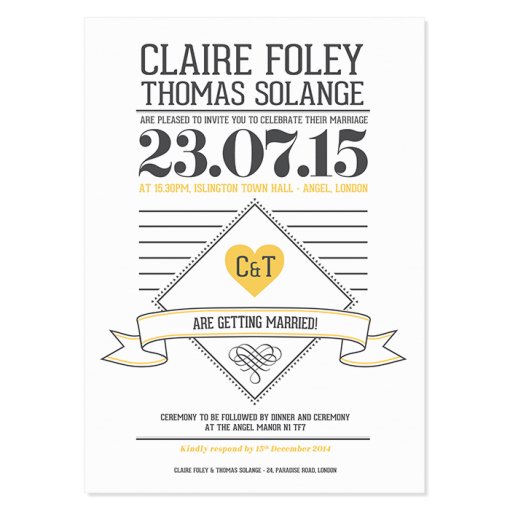 The increasing range of graphic design style and options means that there is an opportunity for people to stamp their mark on their special occasion and the Caractère wedding invitation from Pepper & Joy, is the ideal choice for couples that love the sleek and effective design of many modern posters, flyers and infographics. If you have a modern love, this is going to be the wedding invitation that matches your mood perfectly. This style of wedding invitation looks great but most importantly, it provides all of the invitation up front. Some wedding invitations focus solely on style and leave the recipients scrambling to find the information for the big event. With the Caractère wedding invitation, the information is the design. This means that you realise everything you need to know within seconds of looking at the card, and it also provides the ideal keepsake for your guests. This is a wedding invitation that doesn’t just look great, it looks great while providing all of the relevant information for your special event, making it an important card in the run-up to your wedding, and a keepsake that people will look back on fondly for many years to come. With a choice of colours, the card can be accessorised to be more meaningful to you but the simplicity of the invitation, and the related stationery options, will ensure that this is a perfect wedding invitation for so many happy couples.